Sis' wedding Saturday was great. 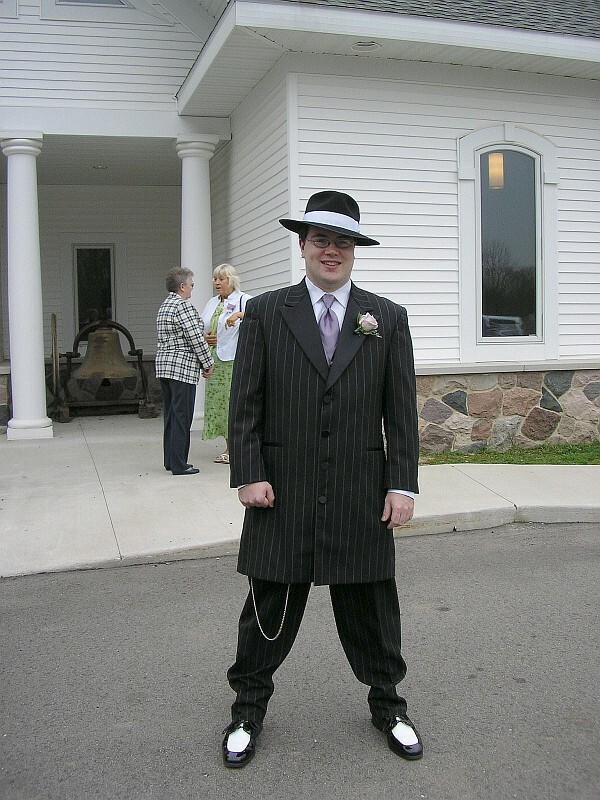 Here's me in my zoot suit from the wedding. Started my new job today. ASP programming using PerlScript primarily, but a lot of other things too. Seems cool. Took parents and sis and Russell to the airport this morning... left around 5AM... pretty tired now. Trustflow II? A lot of soulxchange people and people tied to the old #42 channel. Some people high in the lists are only tied to me by a single person. Weird. Thanks! All of us in the wedding party had the zoot suits. :) Wedding was in Eaton Rapids, Reception in Lansing... should have some more pics from both in a few days.